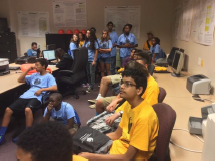 For the third year in a row, the UCF Transportation Systems Engineering program was represented at Camp Connect. 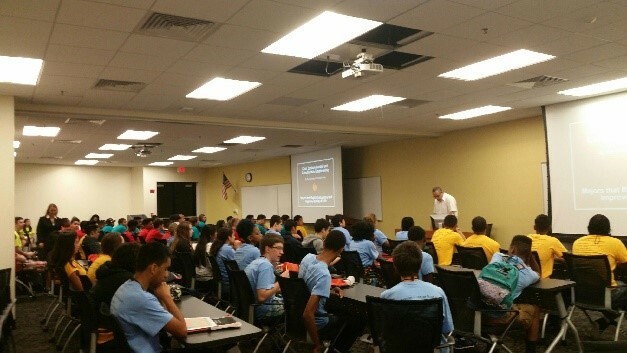 This camp, held at the University of Central Florida, is a week dedicated to enlightening school children, in the 8th to 10th grades, about all engineering disciplines. On Tuesday, July 7, Dr. Mohamed Abdel-Aty began the day by presenting an overview of the diversity of disciplines within the Department of Civil, Environmental and Construction Engineering (CECE). Dr. Abdel-Aty explained each type of engineering using real-world examples. 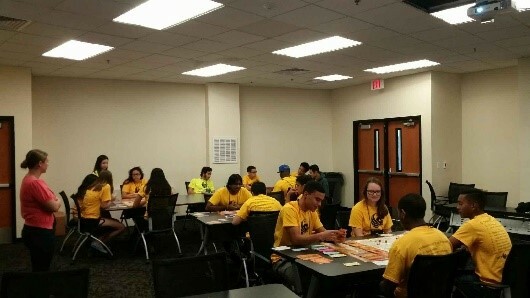 Activities were scheduled for the UCF Transportation Systems Engineering program throughout the CECE day during Camp Connect. The activities included a presentation and a game called The Reservation Road Planner Game. The presentation included a brief explanation and introduction to some of the basics of transportation engineering. During this game, the students were involved in interacting with each other, as well as learning the stages and planning of designing and funding a roadway. The students were first organized into teams. Each student within each team competed against each other during a time limit of 45 minutes. They were to each draw two cards that explained different two different projects and choose which project they would continue the game with. Once each student chose a project on which they would work, they began the five stages of the game. These stages included development, project inventory inclusion, funding, preconstruction, and construction. To represent the fluctuations of a project, players were subject to fees, abrupt changes in the project guidelines, and bankruptcy. The student who completed the most stages and had obtained the most money by the end of the 45 minute duration won. Through the efforts of Michelle Noch, two years ago, the Federal Highway Administration gifted The Reservation Road Planner Game to the Camp Connect initiative here at UCF. Alex Navarro, Kali Carroll and Ryan Selby were proud to prepare and facilitate gameplay and the presentation for each of the groups that participated throughout the day. The game allowed students to compete and engage in challenging tasks as well as giving them a basic understanding of what a transportation planner has to deal with on a daily basis. Not only are the students entertained, but also learning at the same time. Students were also encouraged to ask questions in regards to the transportation engineering field, specifically about what is accomplished in the work as well as current and future topics of interest. National Center for Transportation System Performance and Management Tier 1 UTC. Project Scope: National Center for Transportation System Performance and Management The University of Central Florida (UCF) is a member of a Tier 1 University Transportation Center (UTC) called the National Center for Transportation System Performance and Management (NCTSPM) and sponsored by Research and Innovative Technology Administration (RITA) of the USDOT. The consortium is led by the Georgia Institute of Technology who is the recipient of federal funds. Funds to support Center-related activities at UCF will be provided via a subcontract with the Georgia Institute of Technology. Hiring Mr. Alex Navarro to assist with K-12 and STEM initiatives in cooperation with the College of Engineering and Computer Science Diversity office. He will interact with Dr. Fidelia Nandi and Mr. Bruce Furino. 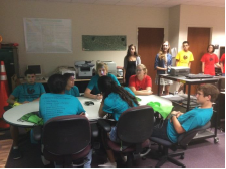 On Tuesday, July 15, Transportation Engineering and CATSS were represented in the Camp Connect program here at UCF. The students were welcomed by Dr. Mohamed Abdel-Aty, who shared an overview of the diversity of disciplines within the Department of Civil, Environmental and Construction Engineering (CECE). Each type of engineering was explained using real-world examples of where its role fits in the industry. The students then embarked on an experience where the students participated in multiple activities revolving around the selected CECE disciplines. Camp Connect has evolved into a multi-year experience that is a summer engineering exploration program with three differing programs for students to return and experience. The successful completion of Camp Connect I provides the returning alumni the opportunity to be invited to Camp Connect II and the sequence concludes with Camp Connect III. Additional programs are increasingly more in-depth with experiences that prepare the students for the challenges and expectations of college and the Science, Technology, Engineering and Mathematics (STEM) opportunities that will follow. The students are engaged in projects, working with professional engineers, and are taken on local lab tours. Targeted for students from underrepresented communities, the program is facilitated each summer by the College of Engineering and Computer Science (CECS) Office of Diversity. Each program is a week-long experience takes 8th through 10th graders into the realm of the engineer by exposing them to the many different disciplines found within CECS. The goal of the camp is to fuel kids to become more interested and realize their desire to become involved in the engineering field. Students participated in presentations, activities, lab tours and were given insight into what the life of a college student and an engineering professional is like, beyond the classroom. The program provided a method of exploration and preparation advice for the start of their college career by networking with students and faculty here at UCF in addition to presenting their experiences to their peers. Once again this year, the UCF Transportation Systems Engineering program was represented at Camp Connect. The activities were scheduled as the part of the camp that covered the various disciplines within the Department of Construction, Civil and Environmental Engineering. Students had the opportunity to become involved with scenarios that role-played the process of planning, funding and constructing a transportation-related project. Called TheReservation Road Planner Game, the students were organized into teams that were to compete to go the furthest in the scenarios within 30 minutes. In thisboard game, each student had their own project that they were responsible for completing, with the goal of completing their individual project the quickest and with the most amount of money left over. The game was made possible through the generous contributions of Michelle Noch, who last year, was instrumental in ensuring the Federal Highway Administration would be able to provide the game as a gift to the Camp Connect initiative here at UCF. Continuing on the successes last year, the game’s rules were streamlined for the timed and team environment based on the feedback from last year’s program. Alex Navarro and Tyler Ward were proud to participate in the program by improving the process, preparing andfacilitating game play for each of the groups that participated throughout the day. In addition to the improvements to overall game play, a new point system was introduced that combined an integrated trivia contest into the activity block and provide students with a heightened spirit of competition. 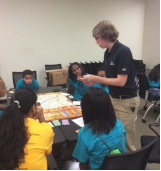 As a crowd favorite, the activity provided competition and challenges to campers while giving them an understanding of what a transportation planner has to deal with on a daily basis. It is with interactive experiences such as this one that students are entertained and educated concurrently. The lessons that were learned gave students a better understanding of how the transportation planning process works. Students chose a project to begin with and took it through the process through as far as they could in the allotted time. The five stages included development, project inventory inclusion, funding, preconstruction and construction. To represent the fluctuations of a project, players were subjected to fees, abrupt changes in the project guidelines and bankruptcy. The game got the students involved with other players on their team as they rallied to take their projects to completion. We are pleased to have hosted these students and give them an opportunity to take a look into the engineering world. 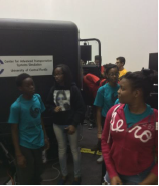 Camp Connect students were able to partake in a tour of the driver simulator that was hosted by the Center for Advanced Transportation Systems Simulation (CATSS), which included a brief presentation about the transportation industry. At the same time, the students were also explored the facilities of our Transportation Lab and were given an overview of the types of work that goes on in both facilities and how they are applied to the real-world. Highlighting the essentials along with some of the applications of transportation engineering and why transportation engineers are an important asset to the community were Erika Meeker and Kelsey Strobridge. Students werepresented the concepts and implementation of those concepts in the industry. In addition, a variety of innovations being applied in the field were discussed. They were also exposed to a number of examples of facilities and infrastructure that are the responsibility of the transportation engineer. Giving students the opportunity to understand how much of the world is touched by the transportation industry and the engineering profession in general was a key component to enhancing theirappreciation of how important engineers are. The goal was to inspire and spark a passion in these young adults for a career in Science, Technology, Engineering or Mathematics. The culmination of the experience was a visit to the CATSS driver simulator. 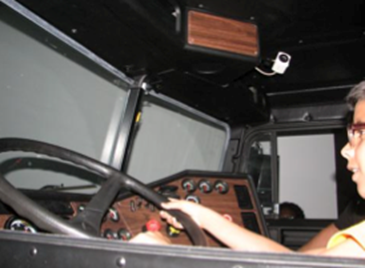 CATSS was able to show the students the driver seat module of a track-trailer cab providing them with a tour and synopsis of the types of projects that may warrant the need for a simulator. Although to many of the students, the simulator may have looked like a video game, it was stressed that this is a vital tool in many research projects that happen here at the university. Hosted by Alex Navarro, the tour began with a visit to the control booth where the systems that run the simulator were explained. Students were asked questions about the scenarios that should be considered for simulation and some of the applications to current topics in research in this field. In addition to providing an overview of the application of the simulator’s use they were also informed of the logistics of the simulator along with the human interactions that may be encountered while the device is in operation. With a variety of configurations, the simulator showcases the diversity of research initiatives that have been undertaken here at UCF. Some of the current research projects were explained to the students as a part of this experience. The team was ecstatic to participate in a program that gives an insight into the fundamentals of what we accomplish. 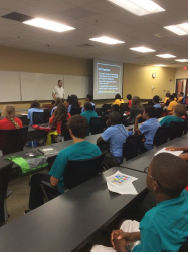 On July 17, 2012 CATSS was showcased in the Camp Connect program here at UCF. Camp Connect is a summer program for students that is facilitated by the CECS Office of Diversity. The week-long experience takes 8th through 10th graders into the realm of the engineer by exposing them to the many different disciplines found within CECS. Students participated in presentations, activities, lab tours and were given insight into what the life of a student and a professional is like in the engineering world. The program provided a method of exploration and preparation advice for the start of a college career by networking with students and faculty here at UCF. UCF Transportation Systems Engineering was represented at Camp Connect as part of the program covering the Department of Construction, Civil and Environmental Engineering. Students were presented the basics of transportation engineering, innovations in the field and a brief synopsis of research in the field taking place right here at UCF. Alex Navarro and Dr. Mohamed Ahmed were proud to participate in the program by preparing and delivering this presentation for the students, giving them an insight to some of the fundamentals in what we accomplish. The culmination of the experience was a visit to CATSS driving simulator. 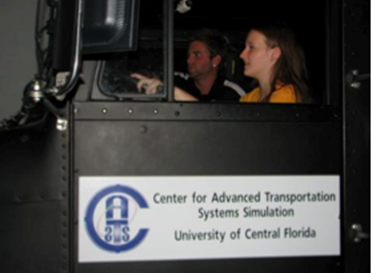 CATSS was able to put students in the driver seat and provide them with a simulation experience. Although this simulator may look like a video game to the students, it is a vital tool in research that happens here at the university. We are pleased to have hosted these students and give them an opportunity to take a look into the engineering.